In North America there are an estimated 2 million street involved youth. 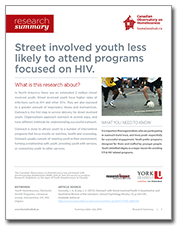 Street involved youth have higher rates of infections such as HIV and other STIs. They are also exposed to a greater amount of respiratory illness and malnutrition. Outreach is the first step in service delivery for street involved youth. Organizations approach outreach in several ways, and have different methods for understanding successful outreach. Outreach is done to attract youth to a number of intervention programs that focus mostly on nutrition, health and counseling. Outreach usually consists of: meeting youth in their environment; forming a relationship with youth; providing youth with services, or connecting youth to other services.